This is the dish I had when eating at Florencia 13 in the village with some friends from work. 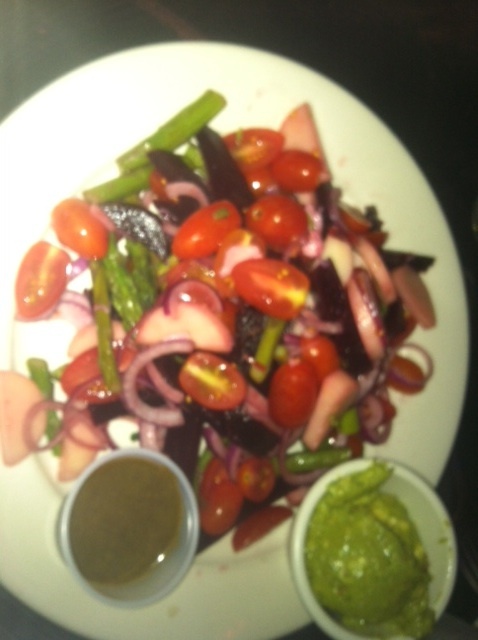 A salad with radishes, tomatoes, asparagus, onions and a side of Guacamole as dressing. Delicious! I mentioned a week ago that you can eat properly almost everywhere as long as you are thoughtful and well-prepared. Today, I want to show you how to eat gluten-free and vegan at a MEXICAN restaurant. YUM! Recently, some of my co-interns and I wanted to go out for food and happy hour. It was a good time for us to get to know each other outside the workplace and just enjoy ourselves. When one of the interns suggested Mexican, I was excited—I’ve got Mexican ordering down! While beans are normally a good source of protein for vegetarians, the beans at most Mexican restaurants are refried and full of lard. Yuk! Black beans, on the other hand, tend to be OK. So if you’re really in the mood for beans when you’re eating at a Mexican restaurant, say no to the refried and opt for black beans if they have them. There are two problems with taco and tortilla shells. First, a lot of them are made with flour, which has gluten and is hard to digest. While Mexican places usually offer corn tortilla options, corn is a food that I approach with caution. Given the extreme mass-production of corn in the United States (its in almosteverything!) it is highly genetically modified, high in sugar, and void of nutrients. So unless you are in luck and find a restaurant that has organic, corn tortillas, try to keep the corn to a minimum. Talk about sugar! Limeade concentrate, tequila, triple sec, oh-my! Obviously alcohol is not the most nutritious thing for anyone in any form, but margaritas really take the cake. Opt for red wine instead, which at least has some beneficial property when consumed in moderation. I love love love guacamole! Filled with vegetables and avocados, it is a wonderful combination of good fats and fiber to keep you full and happy. Most Mexican places will start you out with guacamole and chips. I’ll only have a few of the chips (or if I’m really exercising self-restrain, I won’t have any!) and then give myself a scoop of the guacamole to eat before my meal comes. Some Mexican places have some sort of salad that is vegan and gluten free. The restaurant I went to this weekend had a vegan and gluten-free salad called “El montecito,” so I was in luck. I usually will order my salad with a side of guacamole to use as dressing. So much better than whatever sugary, processed dressing that they might have! If there are no vegetarian salads, however, I’ll order two sides of steamed vegetables with guacamole and make my own. Like I said, it’s important to be creative when eating healthy! If I see that there are black beans on the menu, I’ll ask a ton of questions about them–are they vegetarian? how are they prepared?. If they are not fried and are vegetarian, I’ll add them to my salad to add as a nice protein to round out my meal.